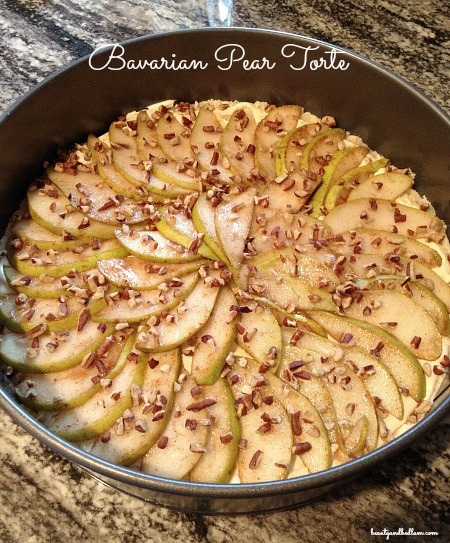 No other recipe have I been asked for more than this easy, yet elegant Bavarian Pear Torte. As a young bride, it was that special recipe that fooled others into assuming my culinary skills were much more advanced than they actually were. This is delicious served as a dessert or perfect for a breakfast or brunch. It’s been a staple at our Easter brunch for years. This recipe originally came from a gifted Bed and Breakfast cookbook, but through the years, I have adapted this Pear torte recipe and used various fruits, with both fresh and canned variations working well. If there’s something simple you want to whip up, yet wow your guests at the same time, this Bavarian Pear Torte is the perfect recipe to try. I’ve made this so many times and have never gotten a picture of what a piece of this amazing torte looks like because as soon as it hits the table, it’s devoured. Imagine my delight when one of my readers, Tessa, sent me hers. I love that she didn’t even peel it entirely and it was still a hit. As you can see, any shape pan works. Her presentation is beautiful! Summary: This easy, yet elegant, pear torte leaves everyone asking for more (and wanting the recipe). Mix butter, sugar, vanilla, and flour. Press into bottom of a 10 inch deep dish pie pan. Mix cream cheese, egg, sugar, and vanilla. 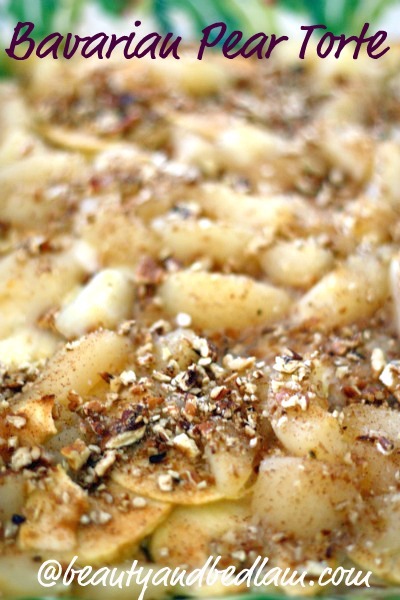 Toss together pear, sugar and cinnamon. Arrange over cream cheese mixture as desired. Bake at 400 degrees for 10 minutes and 350 degrees for 25 more minutes. Allow to cool before removing from pan. any idea whether well drained home canned pears would work? I have those in abundance, and this looks amazing. Oh wonderful, thank you! Can’t wait to try it!!! I wonder if there is a way to make this gluten free, and with something I have on hand. It sounds yummy! The pear recipe is missing a vital piece of information. How many pears and what size? It states four cups of sliced pears in the list of ingredients, so I didn’t really say exactly how many pears that will equal since size varies so much. You will love the recipe. It’s one of our favorites. This is a great recipe – just delicious! I only had one pear, so I made with with a mixture of apples and pears together. It came out wonderful. I can’t wait to try it with all pears! I made this yesterday. It’s wonderful! I used pecans (what I had on hand) and did not peel the pears, instead I sliced them thin and laid them in the circular pattern of the pan and it looked beautiful (I tried to include a photo, won’t let me) thanks for the recipe it’s a keeper.